Dwight (Macon Blair) is a simple man of few words, who sets out to even the score when he discovers that the man charged with the murder of his parents is soon to be released from prison. Returning to his rural Virginia hometown in his run-down car, Dwight hunts down the freed murderer to exact his revenge. There is little time to process the events however as he immediately becomes the subject of another retaliatory hunt, and thus the inevitable cycle of revenge prevents escape for anyone involved. Unlike Drive (2011), which had a sleek and purposefully silent Ryan Gosling as its anti-hero, Dwight just doesn’t really have anything to say. Where Gosling was a professional stunt-driver, Dwight is in fact homeless and lives in his car – the titular blue ruin which is seen rusted and riddled with bullet holes. He has nothing else and as such has nothing to lose. As a result, Dwight’s vacuous nature is given a volatile edge that keeps you in prolonged suspense. Sudden moments of violence take you by surprise in their spontaneity as well as their graphic detail. They create a sense of unpredictability that keeps you in the moment and immersed in the tension, whilst dwelling on the results of violence that are usually glossed over in cinema. This is a film that revels in the complications and failures that stem from revenge. Dedicated purely to his pursuit, Dwight can make you feel locked out and lacking any real connection with him. However, perhaps for this very reason, it feels genuine – believable almost. Almost. Comedic relief comes eventually in the form of Ben (Devin Ratray) an old school friend who decides to help Dwight without asking too many questions – not that he would get much from him anyhow. 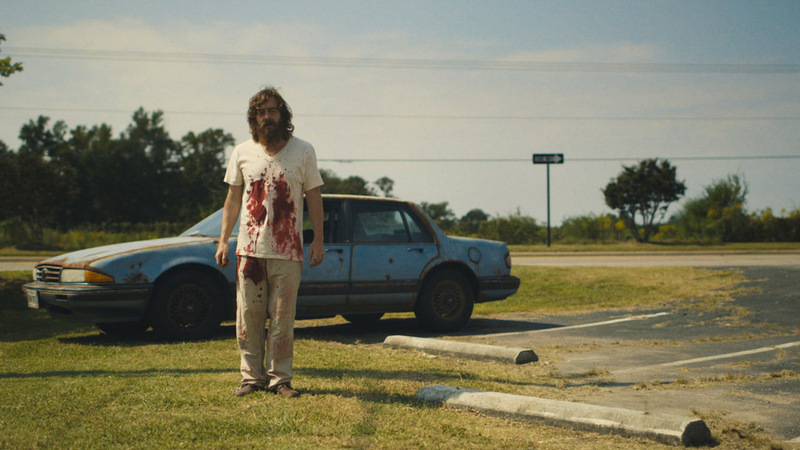 Blue Ruin’s masterful element is in its moments of comedy that punctuate the bleakness. A sigh of relief before you return to the dark reality of the film. Though it is tough to connect with Dwight, the naturalism of the story and its cleverly reserved delivery keep you captivated.